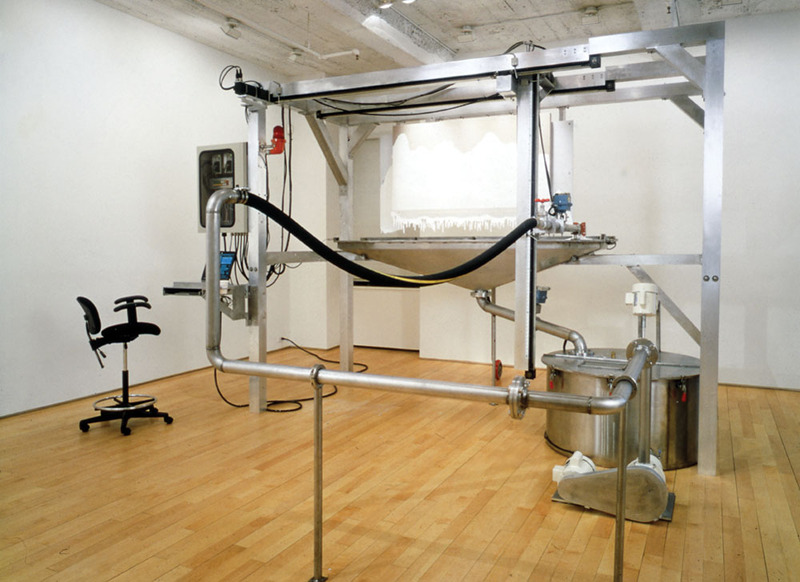 In 1995, Paine began creating a series of unique art-making machines which churn out abstract objects at a deliberately set pace without any intervention by the artist. Controlled by a specially programmed laptop computer, the PMU (Painting Manufacture Unit) is comprised of a large metal scaffold supporting a paint-spraying nozzle aimed at a canvas. A flash of light and an oscillating red warning siren mark the beginning of the PMU’s operating cycle. The unit’s computer commands the release of a series of valves and signals a large mixer to prepare the paint. When fully engaged, a specially designed paint nozzle passes across a white canvas and sprays a stream of white paint. The PMU then returns to its initial position allowing the applied coat of paint to dry. The entire process is repeated between 80 and 200 times to complete one painting. Roxy Paine is sponsored in part by Estelle and Paul Berg, and Cindi and Martin Nash.